Earning money from a Mobile App is easy, only if you do it right. The pace at which new businesses are springing up is mind-boggling, more so in the present-day worldwide tech scenario. Just a decade or so back, people were talking about taking their businesses online, and then the ‘dotcom’ bubble burst. Then everybody said that online merchandising shall never take up. That it was simply illogical. But look now! The Amazons, Ebays and the Alibabas are doing just great. Not to mention the various country specific ecommerce brands who are giving stiff competition to these internationals. In the same way, today we are facing the ‘mobile app’ phenomenon. Since the successes of Apple’s App Store and Google’s Play Store, everybody wants to be up there. And many are fighting it out successfully or unsuccessfully, hanging on, waiting for their monies to finally flow in. So, can we learn anything from their experiences? Assuming that your app maker created a great app, with great content, the very next thing that you would like to do is start earning money. Isn’t it? 1. When it acts as a complimentary platform for your customers to engage with your business, which means that you already have a mainline business in place, and you want to provide your customers with an additional platform from where they can give you their valuable feedback and even place orders online. This is the most convenient reason for creating your great mobile app. Banks, traders, exporters, fashion designers, writers, retailers, and many more small and medium businesses fall into this category of mobile app owners. Almost anybody who runs a business and who wants to give his customers with added ease in interacting with his brand should go for this model. A mobile app used in such a way can be a great advantage for almost every business, barring maybe a few, and boost your business a few notches up. 2. When you don’t have a business, but you have a great creative idea for a great mobile app, which means that the people you are targeting will download your app to solve their varying needs ranging from searching for the best doctor around, or a cab on hire, or for the best movies showing. We are currently seeing a boom in this category of entrepreneurs. Many have moved from rags to riches through this revenue model alone. So, how to earn money from this second mode? 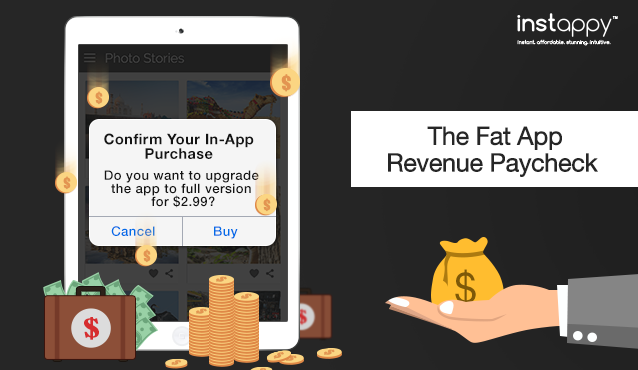 Offer a Freemium App as an initial download and then earn through in-app purchases. Let your users download your mobile app from the stores, and offer them some basic features for free. Categorize the other features as premium and make these chargeable on a one-time basis. Users can pay through the embedded payment options of the store itself. This kind of a payment option is pretty safe and secure. The freemium model is the most common model currently being offered. In case you are sure that your app is high in its utility factor, which means people find it very useful and are willing to pay a nominal amount for downloading it, you can adopt this model. But the model must be very carefully used, as competitors might move in and start offering similar services through a freemium. High utility or engagement services like a dictionary, etc., have been known to have offered through this model. Paid apps with added paid features. This is a kind of a hybrid model of monetizing your app. You offer your app as a paid download and then you charge additional for each update or feature opted for. This is a very risky proposition and might turn out to be uncompetitive in the long run. High engagement services like gaming, etc., can be offered through this model. This is the safest and best way of earning through an app. You don’t charge your users anything for downloading your app. You also offer all major and minor updates for free. Your income comes from the number of times people see banner ads and video ads when they use your app. AdMob can be used for both Android and iOS platforms. Adhere to all these points for your mobile app development and keep earning well. Also stay tuned for our next update on this. Wishing you luck in your mobile app monetization endeavours. A mobile app can be a great advantage to boost your business. Learn how to earn money from a mobile app in just simple steps and keep earning well.